2018 Winner Bernie Tropel shown delivering her winning poem “Undivided Attention” in December. Photo by Carlos Sandoval, Yearbook staff. The 10th annual competition began with students from English classes filling the John F. Kennedy Auditorium; over the course of four class periods. The lights dimmed and emcees Grant Wills and Jaqleen Stepter (c/o 2019) introduced visiting judges, and Kennedy alumni, Henry Adkisson, Matthew Allen, and Quest Sandel. Tropel felt honored, having not expected to win this year with Taylor Mall’s poem. She participated in last year’s competition as a junior with “Beautiful Wreckage” by W.D. Ehrhart, which was more gloomy compared to this year’s more humorous and entertaining choice. 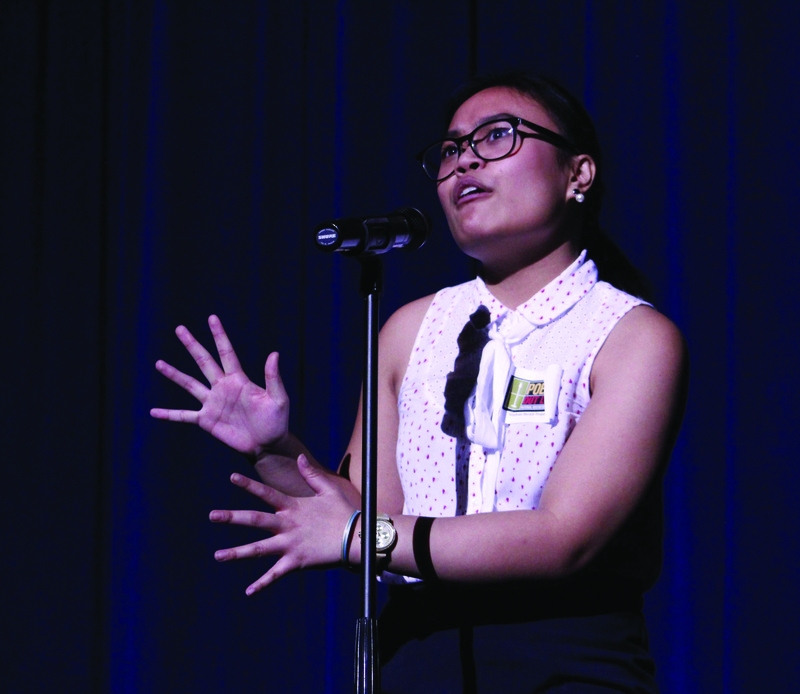 As the Kennedy school-wide winner, Tropel will compete against other schools in the Sacramento County competition on Feb. 7, 2019 with “Bent to the Earth” by Manuel de Luna; if she advances to the state competition, she will be reciting “Rondeau” by Leigh Hunt. Contestants had a range of feelings after reciting their poems some were excited to hear the results while others were relieved that it was over. Students had different reasons for reciting their poems. Some participated for fun, such as Blake Yuyama (c/o 2019) who performed simply because it is his senior year; others such as Andrew Hunsaker (c/o 2020), chose “Negative” by Kevin Young because he saw it as a lens through which to talk about racism and how people are constantly blinded by money. The event was coordinated once again by the Kennedy English teacher David Phanthai. Mr. Phanthai has been and continues to be extremely passionate about poetry, believing that it speaks to young students and allows them to express themselves. As a goal for Poetry Out Loud, he wishes to one day have a state and national winner. 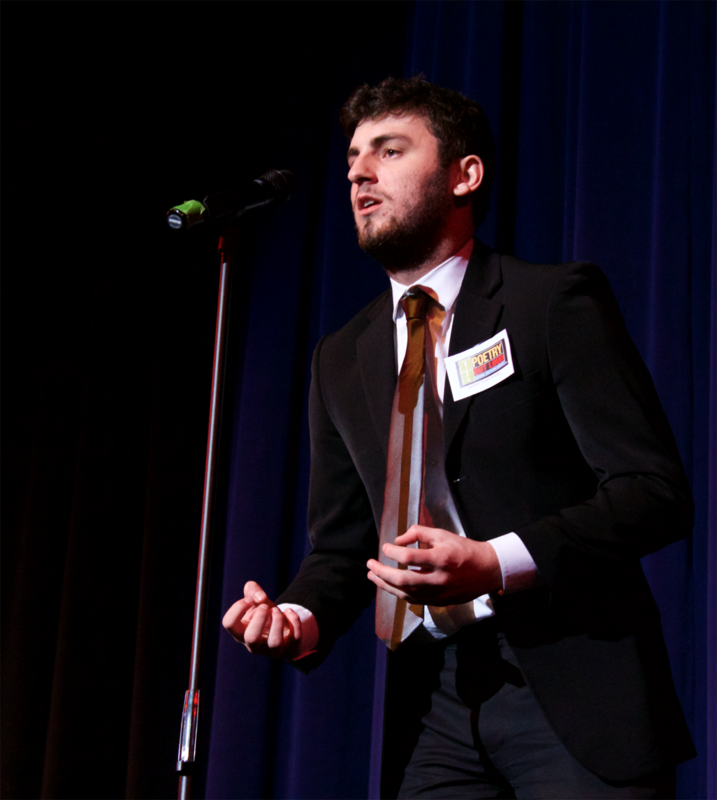 According to him, “Poetry is a celebration of not just art but students and emotions.” Poetry Out Loud includes students from all grades and levels of experience with both veteran hopefuls and amateurs taking part in the competition. This school year the competition included 20 more participants compared to previous years. While the judges decided the winners Gerardoangelo Lopez and Christopher Lee (both c/o 2019), performed original songs. Although they had some technical difficulties in the beginning, Lopez and Lee did not fail to entertain the audience. Kennedy students showed their support by cheering and waving their phone lights around. The event ended with the emcees announcing the winners and recognizing everyone who participated in the competition. Here is the link to the Poetry Out Loud 2018 – “Undivided Attention” recited by Bernie Tropel.